How much do you know about the spiral galaxy ‘Milky Way’? In this article you will come to know about the spiral galaxy ‘Milky Way’. Q. How much do you know about the spiral galaxy ‘Milky Way’? Ans. Milky Way is actually a home to our planet earth. It is the galaxy that contains Solar System. It is named so because the haze of glowing white light it casts in the night sky resembles spilled milk. It is made up of billions of stars, together with gas and dust, held together by gravitational attraction and measures about 100,000–120,000 light-years in diameter. 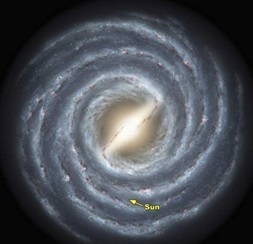 The Milky Way does not sit still but is constantly spinning. It is a typical barred spiral with four major arms. Its central core contains a supermassive black hole which is referred to as Sagittarius. The Milky Way looks brighter toward the Galactic Center.The surface brightness of milky way is relatively low due to the gases and dust that fill the galactic disk. It also prevents us from seeing the bright galactic center. The Solar System is located within the disk, about 27,000 light-years from the Galactic Center. Previous Article How does a pressure cooker help in easy and fast cooking? Next Article How does the navigation system ‘Global Positioning System (GPS)’ work?